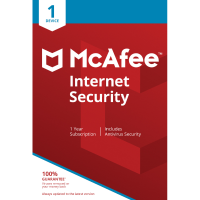 McAfee Internet Security is a mid-range security suite designed to keep your devices safe. There are all the core features you'd expect from any similar suite: antivirus, automatic blocking of malicious URLs, a firewall to shield you from network attacks, and safeguards for your identity and online transactions. A straightforward interface means this is all very easy to use, and for the most part it just works. But the individual modules also have real depth. For example, the password manager doesn't only encrypt your logins with a master password: there's support for logging in with your face or fingerprint, too (if you have a suitable camera or scanner). This version of Internet Security can be installed on a single device, which could be your PC, Mac, phone or tablet.